> Chief Minister K Chandrashekar Rao had dissolved the state assembly eight months ahead of time to advance the elections and is seeking a second term. He heads the Telangana Rashtra Samithi. > The BJP, which is trying to expand its footprint in the state, has hinted it was because of low confidence. > The Congress and Chandrababu Naidu's Telugu Desam Party have teamed up to for the third front. In the past, trends show that independents and smaller parties tend to do better in assembly elections. A look at the Vidhan Sabha vs Lok Sabha election shows how the state voted in simultaneous elections in 2014. In Telangana, unlike other states, urban voters are very important. Telangana has less rural and more urban voters than the rest of India - the 29th state of the country has a 39% urban population as compared to 30% across India. The TRS has a stronger base in the northern part of the state, with the party's average margin of victory being as high as 20% in the 2014 elections. There are eight bellwether seats to watch out for. Andole has always voted the same party that's won the state in the last 30 years. 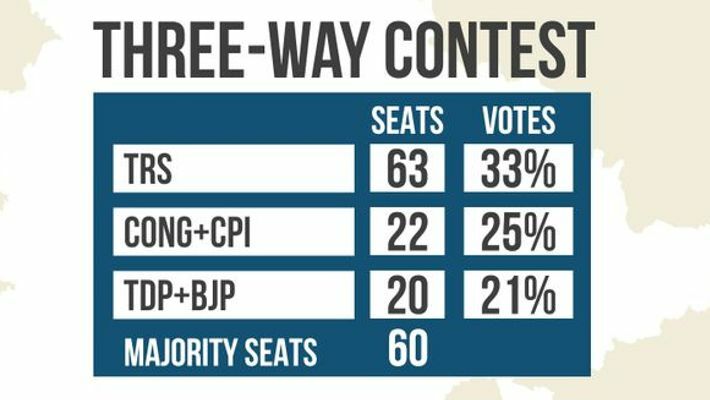 Opinion polls suggest that TRS will cross the hallway mark of 60, but independents and small parties can play the kingmaker here.